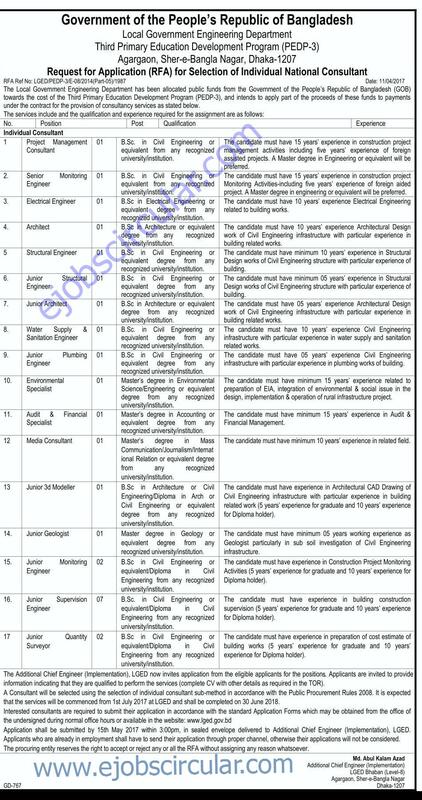 Bangladesh Local Government Engineering Department (PEDP) Published New job vacancy in April 2017. Third Primary Education Development Program PEDP job circular 2017. The circular has published on 13 April at Daily Somokal and Daily Star Newspaper. Third Primary Education Development Program PEDP-3 has been allocated public funds from the Government of the People’s Republic of Bangladesh (GOB) towards the cost of Third Primary Education Development Program PEDP-3, and intends to apply part of the proceeds of these funds to payments under the contract for the provision of consultancy services as stated bellow. Project Management Consultant. Senior Monitoring Engineer, Architect, Junior Structural Engineer, Water Supply and Sanitation Engineer, Junior Architect, Junior Plumbing Engineer, Environmental Specialist,Structural Engineer, Audit and Financial Specialist. A Consultant will be selected using the selection of individual consultant sub-method in accordance with the Public Procurement Rules 2008, It is expected that the services will be commenced from 1st July 2017 at LGED and shall be completed on 30 June 2018. Interested Candidate are required to submit their application in accordance with the standard Application Forms which may be obtained from the office of the Undersigned during office hours or available in the website www lged gov bd. This entry was posted in Govt Jobs 2019, jobs Newspaper, Samakal, The Daily Star and tagged Govt. jobs, Teacher jobs by ejobscircular. Bookmark the permalink.